Researchers at the University of the West of England, Bristol and the University of Bristol worked together to build a system that will enable robots to function without batteries or being plugged into an electrical outlet. Based on the functioning of the human heart, the system is designed to pump urine into the robot's "engine room," converting the waste into electricity and enabling the robot to function completely on its own. I love that line "pump urine into the robot's "engine room." It just sounds a bit strange, doesn't it? Have your buddies over for a kegger and they all get to pee into your robot. Honey, I'm not wasting my day drinking with my buddies, we're powering the robot! After a while do you have to hold the robot down when it knows what's coming? You know, I thought the future was supposed to get awesomer and awesomer. 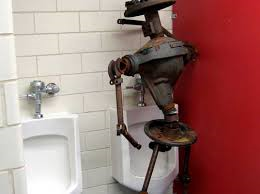 In the future we're going to have to pee on our robots? And this is a good thing? 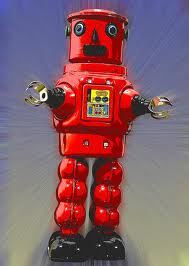 So the good news is that robots may run on urine. The bad news is that nobody will want them. Was this addressed by Robbie the Robot in LOST IN SPACE? Hydrogen fuel cells generally are easily refueled by urine, it takes about half as much energy to extract hydrogen from urine as from water. Sophia's Favorite, I gotta agree with you on this. I think it's actually a great idea of turning a waste product into an energy source. I know it might be disgusting, but the way the author described it, it seems like he doesn't care too much about it unfortunately. Urine, eh? These robots must smell GREAT!